The Lower Platte River Corridor Alliance (LPRCA) began in 1996 as a consortium of three Natural Resources Districts (NRDs) and six state agencies dedicated to working with people to protect the long-term vitality of the Lower Platte River Corridor. 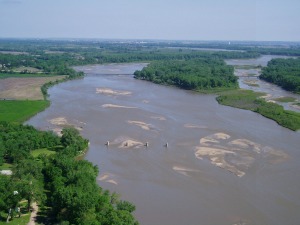 The Lower Platte River Corridor is generally defined as the Lower Platte River, the bluffs, and the adjoining public and private lands located within the floodplain of the Lower Platte River from Columbus to the mouth of the river near Plattsmouth. This area, which runs 110 miles, supports exceptional biodiversity and serves as a valuable resource for Nebraskans. Created through an interlocal agreement, the Alliance uses a variety of “tools” to assist counties, communities, governments, resource management organizations, and the general public to meet Lower Platte River Corridor management challenges. These “tools” include public awareness events, educational workshops, recreation studies, water quality studies, floodplain studies, land-use planning assistance, and a variety of other projects. The Lower Platte River Corridor Alliance works to "Foster the development and implementation of locally drawn strategies, actions, and practices to protect, enhance, and restore the vitality of the river’s resources." Promote increased understanding of the Platte River’s resources. needs of the many and varied natural resources interests in the Corridor.